불영사는 신라 진덕여왕 5년(651) 의상이 세웠다고 전하는데, 당시 이곳 연못 위에 다섯 부처님의 영상이 떠오르는 모습을 보고 거기 살던 용을 쫓아낸 뒤 절을 지었다는 전설이 전한다. 조선 태조 5년(1396) 나한전만 남긴 채 화재로 모두 불에 타 버렸고 임진왜란 때에도 영산전만 남기고 모두 불 타 버렸던 것을 훗날 다시 짓고 많은 수리를 거쳐 오늘에 이르고 있다. 응진전은 석가모니를 중심으로 좌우에 아난·가섭과 16나한상을 모시고 있다. 1984년 수리 공사 때 발견한 기록으로 임진왜란 전·후에 여러번 고쳐 지었다는 것을 알 수 있으며 원래는 영산전이었다고 한다. 규모는 앞면 3칸·옆면 2칸이고 지붕은 옆면에서 볼 때 사람 인(人)자 모양을 한 맞배지붕이다. 지붕 처마를 받치기 위해 장식하여 짜은 구조가 기둥 위뿐만 아니라 기둥 사이에도 있는 다포 양식이다. 앞면 가운데 칸에는 4짝 여닫이문을, 양쪽 칸에는 작은 창을 달아 놓았다. 건물 안쪽은 천장 속을 가리기 위해 우물 정(井)자 모양의 천장으로 꾸몄다. 건물에 남아 있는 단청은 안쪽이 비교적 잘 남아 있어 조선 중기의 문양을 살펴볼 수 있다. 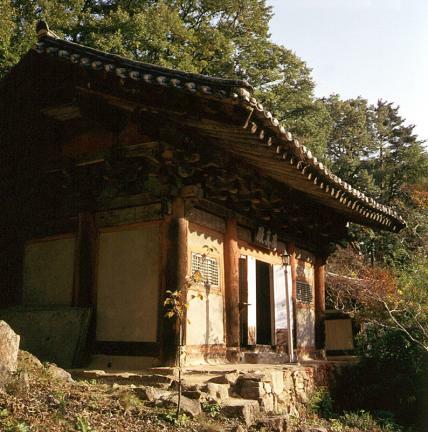 Buryeongsa Temple was built by the great monk Uisang in 651 (the fifth year of the reign of Queen Jindeok of the Silla Dynasty). According to a legend, Uisang saw five Buddha images hovering above a pond in this area, drove out the dragons that inhabited them, and then built Buryeongsa Temple at the site. 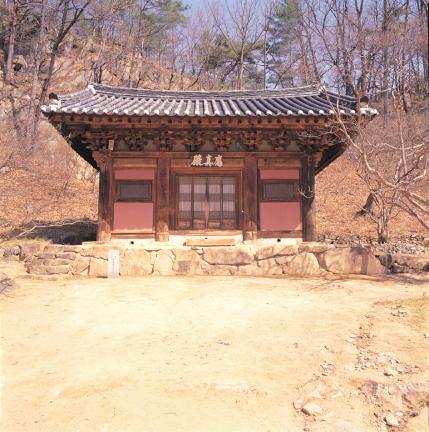 The temple was all but destroyed by fire, with the exception of Nahanjeon Hall, in 1396 (the fifth year of the reign of King Taejo of the Joseon Dynasty), and was burnt down again, this time with the exception of Yeongsanjeon Hall, during the Japanese Invasion of Korea in 1592. After several sets of reconstruction and restoration work, the temple acquired its present appearance. 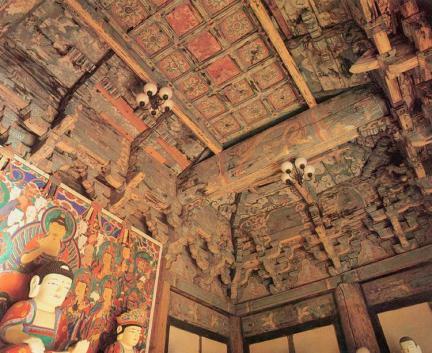 Eungjinjeon Hall enshrines Sakyamuni Buddha at the center, Anan on the left, Gaseop on the right and sixteen Arhat statues. 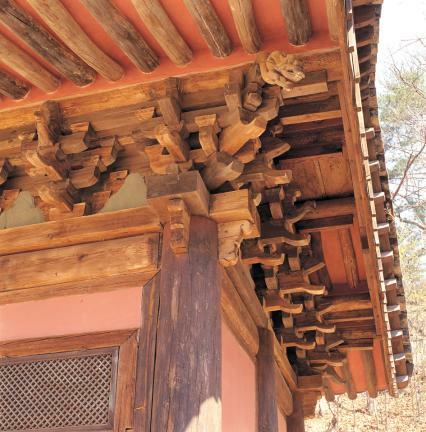 According to a record found during repair work in 1984, the hall was rebuilt several times before and after the Japanese Invasion of Korea in 1592, and was originally called Yeongsanjeon Hall. 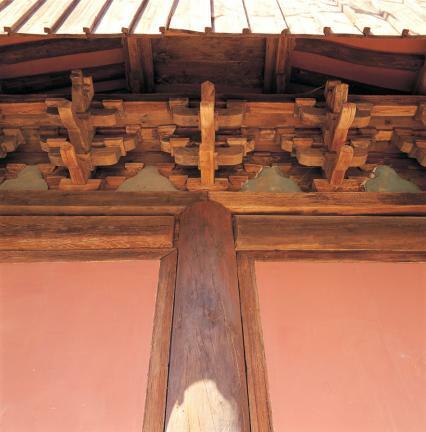 The hall measures three kan (a unit of measurement referring to the distance between two columns) at the front and two kan at the sides, and has a gable roof resembling the letter 人 when viewed from the side. 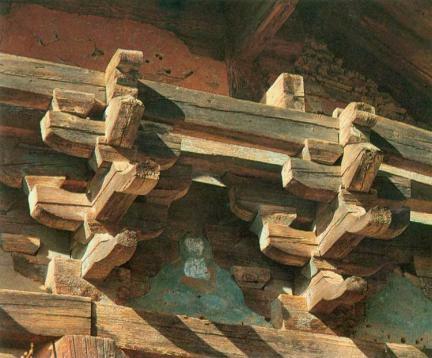 The eaves of the roof are supported by a system of decorated brackets placed on and between the pillars. Two pairs of sliding doors are installed in the middle of the front space, and there are small windows on the sides. 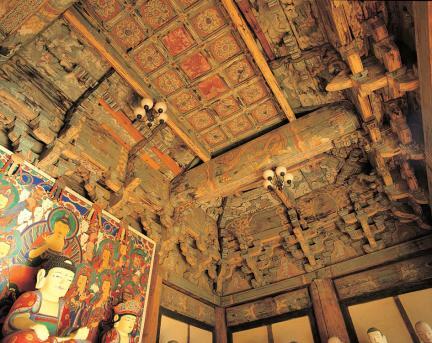 The ceiling is decorated with patterns of the Chinese character ‘井' , which was designed to hide the inside of the ceiling. 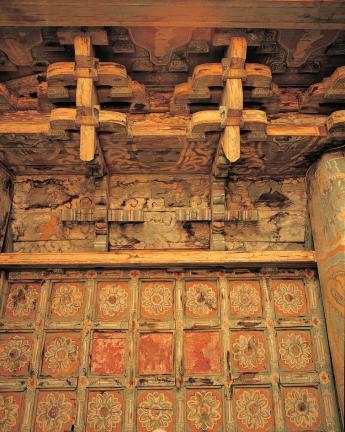 The building’s mid-Joseon dancheong patterns (traditional multi-colored paintwork on wooden buildings) have been well preserved.